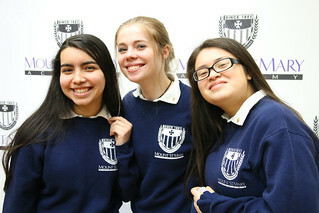 Mount St. Mary Academy celebrated Founders Week during the first week of February. The week marks 167 years since the school’s founding Sisters of Mercy opened the school on February 5, 1851, at the request of Arkansas’ first Catholic Bishop. 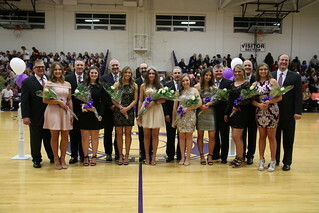 Leading up to Founders Week, the school’s Homecoming basketball game took place at the Catholic High School gymnasium, where the Belles played the Central High School Tigers. MSM basketball team member Lona Ceccherini was crowned 2018 Homecoming Queen as the Mount St. Mary Homecoming Court was announced before the game began. On Tuesday, February 6, the student body gathered in the McAuley Center for the Mount St. Mary Academy Founders Day and Sophomore Pin Mass. As students entered the gymnasium, the Angelus Bell rang out 167 times in honor of the school’s 167-year history. The bell was given to the Sisters by Bishop Andrew Byrne at the school’s first location in downtown Little Rock. As part of the Founders Day Mass, the 10th graders in the Class of 2020 received their Mercy pins, which serve as reminders to the sophomores to live the Mercy values in their everyday lives. Founders Week 2018 ended with a new celebration for parents, alumnae and friends of the school. 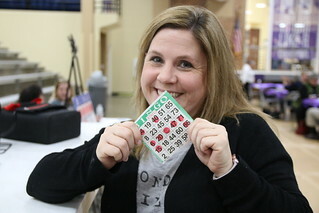 The first-ever Belles Birthday Bingo was held Friday, February 9, in the McAuley Center gymnasium. Parent volunteers served up grilled hot dogs, a chili bar and birthday cake before the bingo games began. Two fifty/fifty “split the pot” games rewarded two lucky winners, alumnae Debbie Wright Harris ’75 and Marilyn Lenggenhager ’73, and proceeds from the event benefited the Belles Booster Club, which supports student programs and activities at Mount St. Mary. Fore more photos from these events, click the Flickr albums below. This entry was posted in Athletics, Events, School News on February 14, 2018 by MSM.